The UK concert from 1992 captured in this video is often billed as Nirvana's high point. I would dispute that because I saw the grunge legends on my 21st birthday at the legendary St. Louis show the previous year, when leader Kurt Cobain called the entire crowd up on stage at Mississippi Nights. That pandemonium-laced show occurred just days before Nevermind was released. I had attended just as much to see openers Urge Overkill as I had Nirvana. But they had me in their pocket after that from then on. A lot of people have claimed Nirvana was overrated, but it's not really quantifiable. They were the perfect band for the time, and their three studio albums remain some of the top releases of the 1989 to 1993 era. 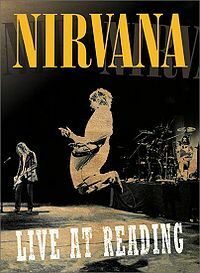 Nirvana: Live at Redding represents mastered footage of one of the most heavily bootlegged shows in rock history. Although this three-piece band may have been just as good at that 1991 St. Louis show, it would be disingenuous to short-change the pounding, ferocious post-punk blast of this concert. There isn't a less-than-great song in the 25-number set, which includes great covers of Mudhoney and Wipers tunes. How about an update on precocious Jackson, and a current picture? Plus reading and reviewing the many books, writing music, bike riding for miles, hiking, etc.--you are a great DAD.